The four-star Tsokkos Gardens Hotel is a family-friendly place for guests to reside during their holiday. Located about an hour’s drive away, Tsokkos Gardens Hotel provides a comprehensive set of facilities. Rooms are a joy to stay in with their well-designed interiors which are light and uplifting and come equipped with all the essential amenities you would expect from a four-star hotel. 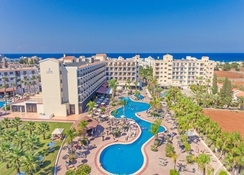 Tsokkos Gardens Hotel excels in providing entertainment for all members of the family. Daily entertainment programmes include theme nights and live music and dancing. Younger ones will love the playground, children’s pool and their own activity programme. In addition, recommended visits to the Ocean Aquarium and the Magic Dancing Waters Live Show should be on your itinerary. Delicious international and local dishes are served at the hotel’s three restaurants and many more fine options available within an easy walk from the hotel. 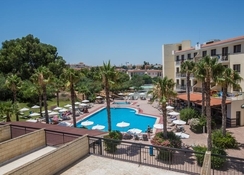 Tsokkos Gardens Hotel lies approximately 65km from Larnaca International Airport. The golden shingle beach of Marilta Bay can be reached by a pleasant, short stroll from the hotel. Excellent restaurants serving international and local Greek and Cypriot dishes are within an easy walk from Tsokkos Gardens Hotel. Family fun entertainment such as the Ocean Aquarium and Magic Dancing Waters Live Show can be had following short taxi rides. 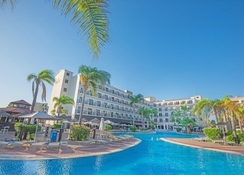 The main hub for conveniences including retail shopping is located approximately three miles away though smaller shops are dotted around the immediate area of the hotel. Rooms at Tsokkos Gardens Hotel are light, bright with carefully and delicately designed interiors that maximise the beautiful Cypriot sun. These typically come with double or twin beds and are made to accommodate up to four guests. As you would expect from a four-star hotel, rooms are kitted out with all the necessities you’ll need for a comfortable time away, including wi-fi, room service, air-conditioning and private en-suite bathroom. A room at Tsokkos Gardens Hotel will overlook either the pool, garden or street. You might want to start your holiday with breakfast served to your room. After which you can also check out the great restaurants on offer at Tsokkos Gardens Hotel. 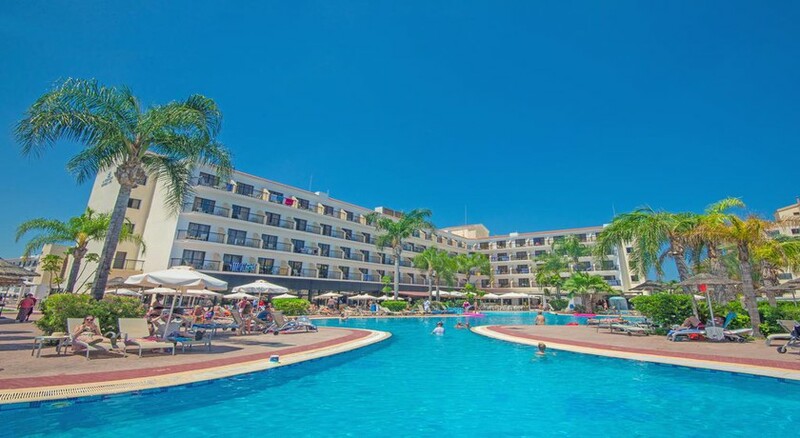 The two main restaurants include a-la-carte and buffet restaurants catering to international and more local, Greek and Cypriot tastes as well as two bars serving great selections of alcoholic and non-alcoholic beverages. Outside of the hotel, you will find bringing a range international flavours to this region, from Chinese at Wan-Chai, juicy burgers at Mojito Bar & Grill and Italian comfort food at Il Cavaliere, all within easy walking distance. If it’s a chilled night at a bar you want, then the nearby Spectrum and Station Bars make the perfect starting point. You’ll scarcely have to venture away from Tsokkos Gardens Hotel to find ways to relax, be entertained or stay active with a large assortment of sports and leisure activities to be had. Daily entertainment programmes are put on that offer something for both adults and children alike and include theme nights, live music and dancing. Guests can stay active at the gym or tennis courts or unwind with a massage, a steam bath or simply at the pool among other options. Children are well looked after with safety and fun both paramount. Activities include a daily children’s activity program, playground, playroom and freshwater swimming pool. If that’s not enough then hop in a taxi and check out the Ocean Aquarium and the Magic Dancing Waters Live Show, where neither will disappoint. I took my two children and my mother with me. Lovely clean hotel. Good size room for all 4 of us with a huge balcony. The pool is lovely and big. We went in October so not many people in the hotel. The staff didnt come across very friendly to begin with but they were stull helpful and professional, we put this down to it being the end of the holiday season where most staff were probably tired... But then the last few days they all seemed very happy and friendly, maybe because it was almost time for them to finish. Last day they put on a massive BBQ for all their staff and guests which was free. It was lovely. Beach was to far for my mum to walk who has walking difficulties but would have been ok to walk to for me and the children. However we booked a taxi to take us to a recommended beach called Figleave beach which was 5mins away by taxi and another day we went to Konnas beach which was a little further. Both beaches beautiful with clear crystal seas. Konnas is hidden in the mountains, stunning and highly recommened. The hotel has many eating places and shops surrounded it if you get bored with the buffet style. The food was ok but the best was the traditional BBQ food on the last day. Desert wasnt great and more a less the same each night. The staff were very helpful when we asked for more sheets and other information that we needed. Very helpful!! Nothing was too much trouble. I would go back again but would eat out a bit more to get a bit of variation as the food can be a bit repetitive in the hotel. Breakfast was great though!